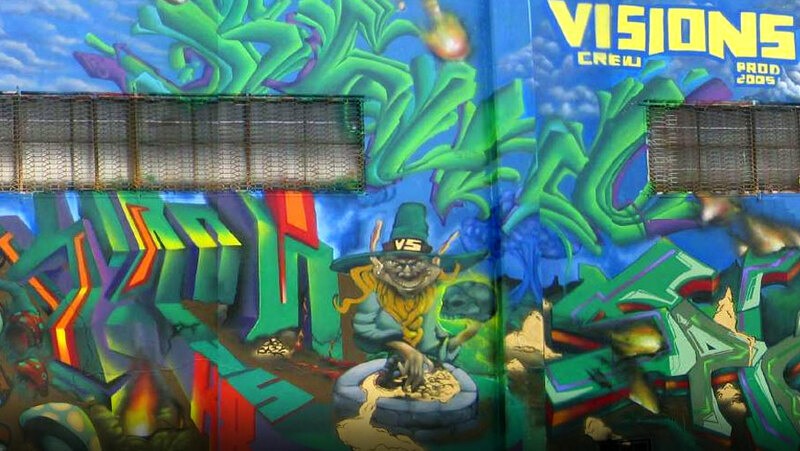 KaterOne, Visions Crew 2005, East Los Angeles. When I was younger, I wrote graffiti for the thrill, anonymity, and recognition from other graffiti writers. As a graffiti writer, I didn’t realize the passionate debate over graffiti as art or crime like I do now—a discussion that is pointless in my opinion. A more productive question to answer by those on either side of the fence is, what is the role of graffiti in our public space? The obvious answer—some would argue—is that graffiti should NOT play a role and that it ought to be eradicated. Well, I’d like to challenge that. The writer did note that commissioned works—even those painted by graffiti artist and clearly graffiti—were NOT “really” graffiti, because they had authorization. The problem with arguments about the legality of graffiti or those that defend it as art is that they ignore aspects of graffiti that relate to how we use our public spaces. To say that there are no positive contributions by graffiti implies a set of criteria by which we determine what provides and what does not provide value. What is that criterion? Who defines it? Is the criterion accurate? Most people would say that the law sets the criteria, but it would only take a basic history lesson to point out that some laws can be unjust. When we submit law a the ultimate criteria for what is and what is not legal or of value, then we must submit the amount of corporate control, immigration, civil rights, etc. through that criterion—which we don’t. If we solely rely on the denotation of graffiti to ascribe its value, we are forced to accept that what is natural is often socially constructed to the interest of some more than others. I propose that graffiti and graffiti writers’ contributions are valuable, particularly when we speak of public space. The value is in recognizing the socially constructed truths and political agendas that influence our culture, society and communities in ways that we may not want. Graffiti keeps these truths and agendas on check by constantly challenging them. For instance, people might argue that advertising or popular culture does not influence them, but what they mean is that the apparent messages of these cultural productions do not influence them. Adds that try to sell Wendy’s instead of McDonalds, or Pepsi instead of Coke may not have a real impact on individuals. But the underlying myth of consumerism that these ads present when added up to all of the thousands of unrecognized retellings of the consumer myth do influence the nation into believing that the myth of consumerism is not a myth, but is the natural state of human affairs. So today, communities produce almost nothing. As an employee or a student, we are required to produce some things: reports, call logs, sales, etc. But outside of our role as employees, or students, what do we produce? Most of us do not grow or raise our food, we don’t make our clothes, and only a few in the community make their own music or entertainment. Some participate in athletics once in a while, but other than sports and dancing there is little left in society for humans to produce. Instead, we have become consumers. Each time that graffiti is produced, it speaks against the consumerism myth such that it becomes an identity marker of a community.